Our pretty red toaster died this week. 1. There are people who consider trying to fix the circuit board in a $40 toaster? 2. 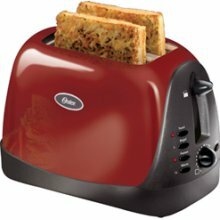 How did we get along for decades with toasters before we had integrated circuits? 3. And why doesn’t this thing connect to our WiFi so it could have downloaded an update that might have prevented the scorching, or at least a security patch? Feeling a little weird about disposing of the toaster too. I guess it goes on the pile of outdated or broken tech junk waiting for a tech recycling day at the local middle school. Given it has circuits it’s likely there are components that shouldn’t go into landfill. And it’s still so shiny and pretty, it feels wrong to dispose of it just yet. Maybe we can rip the guts out and make it into a planter. Isn’t that the solution for so many of these problems? This entry was posted in Design, Food and drink, Geeking around, Home and Family, SciFi Fantasy, Technology, Thoughts, Uncategorized. Bookmark the permalink.